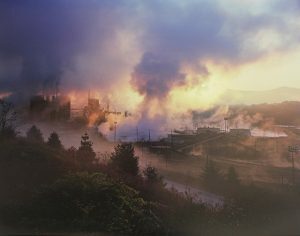 Jeff Rich (1977 – ), Blue Ridge Paper Mill, Pigeon River, Canton, North Carolina, 2008, archival pigment print. Middlebury College Museum of Art. Purchase with funds provided by the Fine Arts Acquisition Fund, 2015.230. Digital photographs are images made from a digital file using a printer that applies very fine drops of ink on paper. Inks may be dye-based, however pigment-based inks have greater stability. The longevity rates of many pigment prints are calculated at over 100 years, depending on the paper used. As digital technology was developed in the early twentieth-first century, the question of print stability led to the development of increasingly stable inks and papers. Materials are subjected to rigorous accelerated again tests to determine how long a photographs will last without significant fading. Today there are many options of digital rag papers and inks that are expected to last more than a century, if prints are properly stored and exhibited. The terms “Archival Pigment Print,” “Giclée Print,” “Digital Ink Print,” and “Inkjet Print” are sometimes used interchangeably for digital prints, however there are important distinctions between the stability of the types of inks used for prints.